Straight Virgin Remy hair extensions are a great way to give you that sleek full look. This Remy hair is beautiful and with matches your hair perfectly. 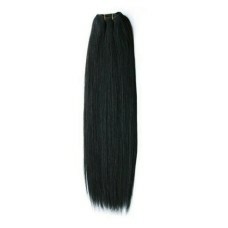 Straight Virgin Remy hair extension is very easy to style and can be flat ironed with conditioning. It can stay perfectly straight or even curled for days! When just ironed this hair has a natural shine and it looks silky and smooth. Our Straight Virgin Remy hair extensions have all the cuticles intact, leaving it easy to use and no tangling. The feel is so natural, you will think it is your own hair. And with proper care, your Straight Virgin Remy hair extensions can last longer than similar synthetic hair on the market. You need to take good care of it. It’s important to use a good conditioner and a good shampoo this will help keep your hair from becoming dry, damaged, and brittle. Now you can have long beautiful hair and no one with know you're wearing hair extensions. You will love the easy maintenance and the longevity of these beautiful natural Straight Virgin Remy hair extensions. straight virgin remy hair extension 14"
Weight 100 gms Style straight Fiber 100% Virgin Indian Remy Hair Application Time 3..
Straight Virgin Remy Hair Extension 16"
Straight virgin remy hair extensionWeight 100 gms Style straight Fiber 100% Virgin India..
Straight Virgin Remy Hair Extension 18"
Straight Virgin Remy Hair Extension 20"
straight virgin remy hair extension 22"
straight virgin remy hair extension 24"
straight virgin remy hair extension 26"
straight virgin remy hair extension 28"
straight virgin remy hair extension 30"